Ebola spreads to health care workers: How are we protecting U.S. doctors and nurses? Are we doing enough to protect U.S. health care workers? 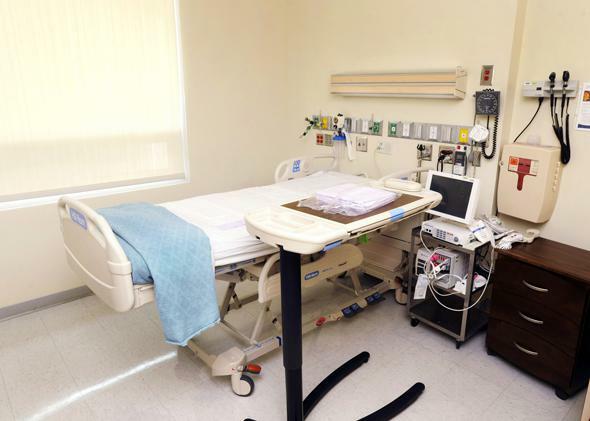 An isolation room at Emory University Hospital on Aug. 1, 2014. Patients suspected of Ebola are whisked into an isolation room, where air can go in but can’t come out. Her hospital rotations in New York City are supposed to be my worry-free time, but I’m just a little bit freaked out these days. There are two patients being treated for Ebola in the United States. Six more people have raised enough concern at U.S. hospitals to be tested for the disease, including one in New York, although they all tested negative. A patient who traveled from Liberia to Nigeria despite known contact with Ebola—spreading the disease to at least 10 more people there—would probably have come to the United States next had death not stopped him. Not everything about Ebola is completely terrifying. There are pathogens that are far more contagious, such as the supernaturally infectious norovirus. Ebola is not known to spread through the air, like influenza, and casual contact between people rarely involves the exchange of bodily fluids. Unlike HIV, the disease doesn’t seem to spread until the carrier develops symptoms. It can incubate for up to three weeks. With that much time, you could take a boat, never mind a passenger jet, from West Africa to the United States. The first symptom is fever. How many people go immediately to a tertiary care center when they get a little fever—even if they have been traveling in areas with exotic diseases? Most of us continue about our daily lives, dripping infectious sweat all over our communities. The next symptoms after fever are headache, body pains, and weakness. Sound familiar? That’s because they describe the beginning of almost every other infectious disease known to modern medicine. It can be a long time before the disease makes its presence unmistakable, through organ failure and liver damage. I’m probably overreacting. Most U.S. hospitals are on high alert and have plans in place. Any patient who comes in with fever of more than 101.5 degrees will be asked, “Have you been to West Africa in the past three weeks?” Those who have will receive the first level of precaution: face masks, separate bathrooms, and gloves for nurses and doctors. Then comes a battery of screening questions: Did you come into contact with an Ebola patient? Were you in a hospital where patients might have had Ebola? Did you go to an Ebola funeral? Did you eat bush meat or have contact with bats? Any positive responses, and things get serious. The patient is whisked into an isolation room, where air can go in but can’t come out. A guard sits outside the room to prevent almost anyone from entering (or the patient from leaving). The unlucky few doctors who are asked to care for the patient wear respirators, special gloves, and gowns. There are detailed instructions for how to take off the protective outfit after contact with the Ebola patient. Virtually everything relating to the patient—prescriptions, laboratory tests, the chart—is stamped with a warning about suspected Ebola. I wonder how effective the regime would really be if it were tested in an outbreak. How many people will an Ebola patient get close to before finally being ushered into a room with negative air pressure? Friends and family. At least a couple of nurses. One or more doctors. Several sick and vulnerable people in the waiting area, along with their companions. How do we know that the disease won’t spread to health care workers in the United States the way it has in Africa? Why is infectious disease in brackets? Because the original quote was about methicillin-resistant Staphylococcus aureus. Fäkenheuer and his colleagues are not complaining about inadequate Ebola controls, they are criticizing hospitals for imposing too much isolation on patients with suspected MRSA. Unlike Fäkenheuer, I’m not remotely concerned about over-reacting to infection. Creating anxiety in MRSA patients is a small price for keeping medical staff safe. The part of Fäkenheuer’s complaint that worries me is his point about the lack of evidence. We rely heavily on the fact that there currently isn’t much deadly infectious disease in the United States. We should spend far more time and money making sure it stays that way. No matter how you lean on infection control—whether you want to drop infectious patients into a vault 20 stories underground, or let them run naked and coughing through the hospital corridors—that choice should be based on an abundance of data and modeling. Maybe I’m just a paranoid husband. It’s unlikely that my wife—or any other doctor—will come unexpectedly into contact with Ebola in the exam room of a U.S. hospital. But this is the first disease that appears to really target health care workers. I wouldn’t mind a little bit more assurance that we’re doing everything we can.